If you're going to be anywhere near New York City next week (Monday, March 14 through Sunday, March 20), there's a fabulous lineup of young-adult authors every night (and on several days as well), ready to entertain and enlighten you in ways you can't imagine. Wow, that sounded cheesy and stilted. Can you tell I haven't written a blog post in almost two weeks? I've been so deep in Shade #3, writing a super-rough draft that no one but me will ever see (which gives me permission to make it really, really rough, with phrases like "[insert joke/description/emotion here]" and "[go back and make it so she doesn't know this until later]"), that clearly I've forgotten how to put words in order for public consumption. The Teen Author Festival is run by the amazing author (and Scholastic editor) David Levithan, who co-wrote (with John Green) Will Grayson, Will Grayson (one of my favorite books of last year) and also wrote, with Rachel Cohn, Nick and Norah's Infinite Playlist (one of my favorite books of any year). 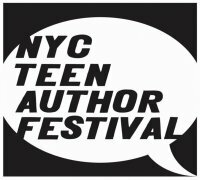 2011 NYC Teen Author Festival Schedule! YA Rocks, featuring Tiger Beat! Washington Irving H.S (in conjunction with Mulberry St Branch) - 40 Irving Place, 10am. For more information or to RSVP for the different events, check out the Teen Author Festival Facebook group page. It's things like this that make me wish I lived in New York! Any idea if authors are only signing at the BoW event (not all participants for the week are on that day's schedule). Or will they sign if asked at the other events? HayleyAGE: I know, right? I wish I could attend the other events all week. You would think people would want to come to FL but not so much I guess. Karen: I think most of the authors participating actually live in New York. Plus it is sort of the center of the publishing world, so those of us who visit can also have lunch with our agents/editors while we're there. I was in Orlando two years ago, and you missed me! ;-p I might be in Tampa/St. Pete in October, but only if these stupid airfares start coming down again.